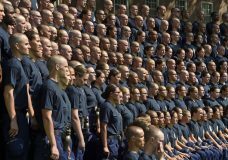 HARTFORD, Conn. — The Department of Homeland Security’s inspector general is investigating allegations of racial discrimination at the U.S. Coast Guard Academy and inadequate follow-up by the school’s leadership, the agency said Thursday. HONOLULU — U.S. Coast Guard and military crews are searching the ocean off Hawaii for five crewmembers of an Army helicopter that reportedly went down during a training exercise, authorities said Wednesday. VANCOUVER, British Columbia — Five people died after a whale watching boat with 27 people on board sank off Vancouver Island, and one person remained missing, Canadian authorities said. JACKSONVILLE, Fla. — The Coast Guard officially ended its search Wednesday for the missing crew members from a U.S. cargo ship that sank off the Bahamas during Hurricane Joaquin.